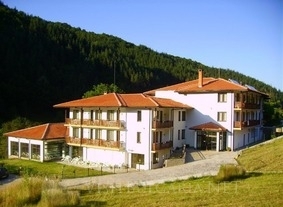 Location: Spa Hotel Feya is situated in Chiflik resort in the Central Balkan nearby Troyan. Accommodation: The hotel offers 28 double rooms and 2 apartments. All rooms are comfortably furnished and offer mini bar, cable TV and Internet. Spa & Wellness centre: The spa centre of the hotel offers steam bath, laconium and sauna. Massages and hydro-jet baths are also available upon extra charge. Guests of the hotel can also enjoy indoor and outdoor swimming pools. Wine & dine: The restaurant of the hotel can welcome 70 visitors and offers delicious and healthy food and a special selection of wines.